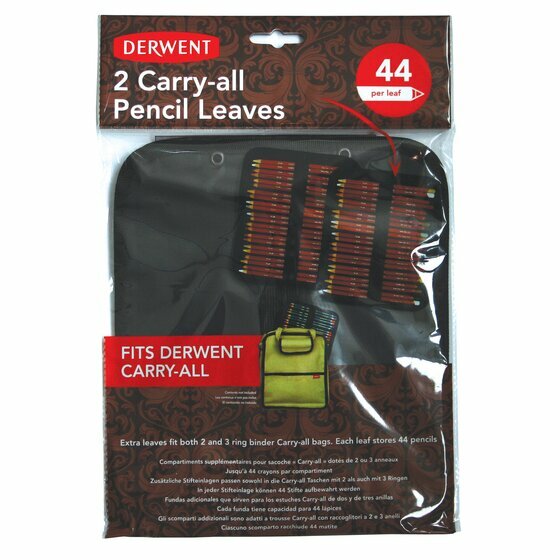 This pack of two pencil leaves can be added to an existing Carry All, the ultimate pencil storage solution. Each leaf holds 44 pencils and the Derwent Carry All will hold 5 leaves – that’s 220 pencils! This pack of two pencil leaves can be added to an existing Carry All, the ultimate pencil storage solution. Each leaf holds 44 pencils and the Derwent Carry All will hold 5 leaves – that’s 220 pencils! Alternatively, Pencil Leaves can be used as a nifty way to store pencils in a binder, or just pop them in your bag! Very compact - ideal for the artist on the go.